NEXCOM has recently partnered with several bus carriers throughout Europe to facilitate everyday commuting with its Passenger Information Systems. Passenger Information System displays useful real-time information to make journeys easier for locals and tourists. As technology spreads and transforms cities, NEXCOM has recently stepped in with its Passenger Information Systems (PIS) to help facilitate everyday commuting for bus riders in Europe. In countries where buses and other public services cope with great audience on a daily basis, an upgraded system that conveys current route information and engaging advertisements can make every ride more enjoyable, while increasing revenue for bus carriers through new alliances. NEXCOM's PIS, that comprises of a 21.5” panel PC TPPC 2210T and TPPD 2200 displays, was able to achieve an engaging experience with minimal installation effort and superb remote management capabilities that the bus carriers were looking for. Automatically turned on when the bus starts, the passenger information system displays useful real-time information such as date, hour, route, current station, and upcoming stops to make journeys easier for locals and tourists. Taking advantage of NEXCOM’s solution placed in different areas of the bus, riders of all ages can enjoy immersive content from diverse topics updated remotely. Moreover, full HD resolution captivates passengers’ attention with stunning commercial advertising, opening business opportunities for bus carriers and creative agencies. 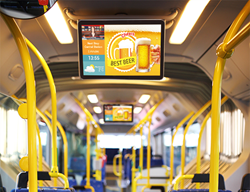 In addition to richer content for bus riders, NEXCOM’s passenger information system eases installation for system integrators with simplified wiring and extended on-board coverage. The fanless panel PCs support daisy chaining over Ethernet, which means that up to eight TPPD 2200 displays can be connected in series to each other and controlled by one TPPC 2210T. The simplicity of this configuration permits system integrators to place cables inside the handlebars to connect one display to the next and avoid many alterations in the interior of the bus, reducing deployment time, and expanding their business opportunities to target other means of transport such as articulated buses and trams. About NEXCOM: Founded in 1992, NEXCOM integrates its capabilities and operates six global businesses, which are IoT Automation Solutions, Intelligent Digital Security, Internet of Things, Intelligent Platform & Services, Mobile Computing Solutions, and Network and Communication Solutions.